A recent survey found that Australia has one of the most flexible working environments in the world, a trend which is starting to be reflected in how people build their dream home. According to Nutrend Homes Sales Consultant, Peter Nastrom, the increasing acceptance of agile working is driving interstate growth and changing the way people design their homes. “While recently there has been a lot of hype around the Commonwealth games driving growth on the Gold Coast, we have witnessed a significant growth in the number of interstate buyers over the past two years, with now a third of our clients coming from interstate,” said Mr Nastrom. “This growth is enabled by agile working which has made it possible for young professionals and businesses owners to literally pick up their businesses and move them here, allowing them to take advantage of the Gold Coast coastal lifestyle, without disrupting their careers. “In the past 18 months we have seen a spike in the number of people requesting a fully attached granny flat – that is more often than not for a home office. “As the traditional working model where you have to physically drive to an office continues to change we are going to see more and more people requesting this option in their homes. 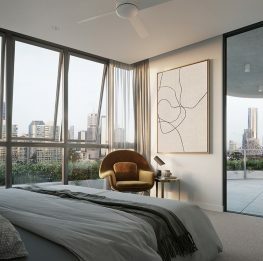 According to data compiled by independent property consultant Michael Matusik, the average lot size in new developments on the Gold Coast has shrunk to a handkerchief-sized 462sqm. QM Properties general sales manager Damien Ross said QM Properties has extra-large lots on offer at Tuxedo Junction acreage estate, Coomera Quays waterfront estate, and Coomera Waters stage 27. 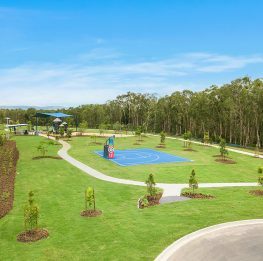 “Demand for large lot releases at both of these estates has been exceedingly strong with astute buyers taking advantage of the large, freehold waterfront home sites at Coomera Quays, while those seeking a tree change are snapping up the hinterland acreage at Tuxedo Junction. “Increasingly we are seeing buyers come from interstate, who are seeking not only our better weather but more for their hard-earned money than what is possible in the southern states. House and land packages on lots sized 4000sqm to 9213sqm from are available at Tuxedo Junction from $375,000. 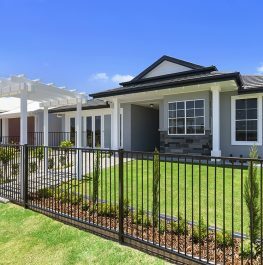 Luxury 4 bed home + study house and land package on a large 757sqm with landscaped river front allotment backing onto parkland are available at Coomera Quays from $729,500.